Worried about buying the wrong size? Wrong color? 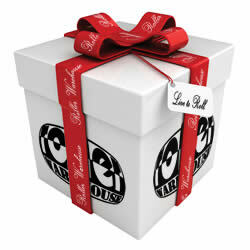 Hook up your loved ones with a gift of choice! Let them choose whatever they want. Use Promo Code: GIFTCERT for Free Shipping on this item. Will be sent out in a stamped envelope via USPS. We can also email you a copy if you'd like, just let us know! Comments: Nice to have this option when one cannot decide which item would be preferred by the recipient. Comments: Nice option if you're not sure which item the recipient would choose.